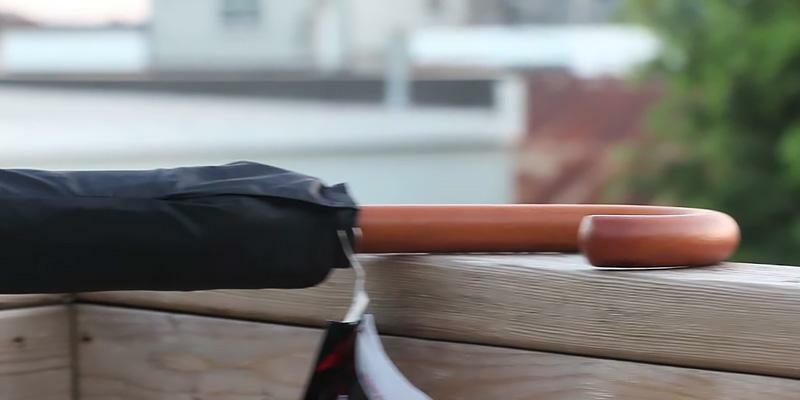 This rain umbrella features absolutely unique design, as it folds inside-out with the wet side folding inwards to prevent any dripping and keep all the water inside until it drips dry. Thus, your car seats and foyer will stay exceptionally dry on rainy days. An original C-shaped handle will allow you to conveniently carry your umbrella around or even hang it in the hallway. A little bulky handle may occasionally cause inconvenience. 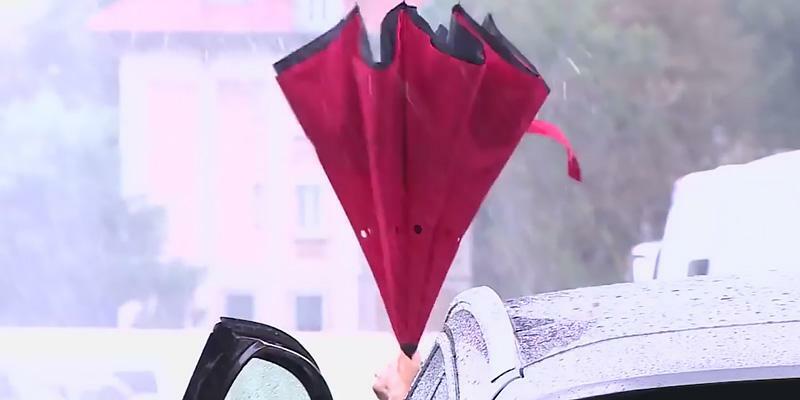 If you are tired of having floors and car seats wet on rainy days from the water dripping from your umbrella, this unique rain umbrella will offer a solution to your malaise. It is an excellent choice for all car owners who can no longer struggle with closing and opening of their umbrellas in the rain. This fantastic rain umbrella will keep you dry, as it features a perfect closing angle and can be easily folded once you are safely in the car. Besides, there is an ample selection of colors and patterns. Deeper and larger dome-shaped canopy provides effective protection not only from the rain but also from strong gusts of wind. 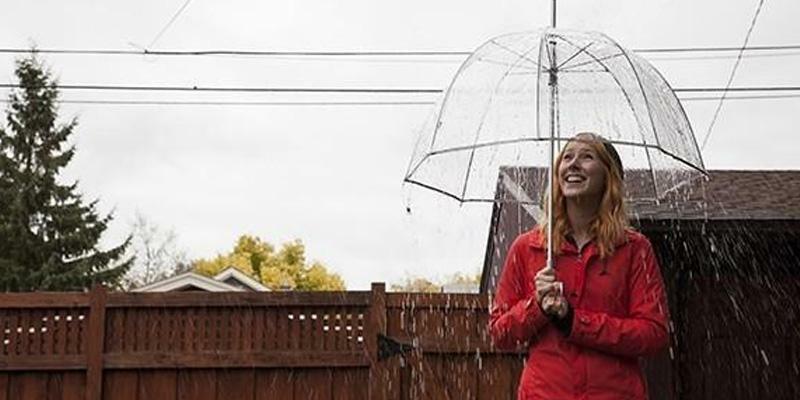 This bubble rain umbrella will effectively keep your head and shoulders dry. You need to open and fold the umbrella manually. This bubble umbrella is ideal for everyday use. It is equally suitable both for men and women. A transparent canopy provides excellent visibility and makes this model very convenient for use on busy streets of the city. Choose a print to highlight your style from a wide selection of available color solutions. 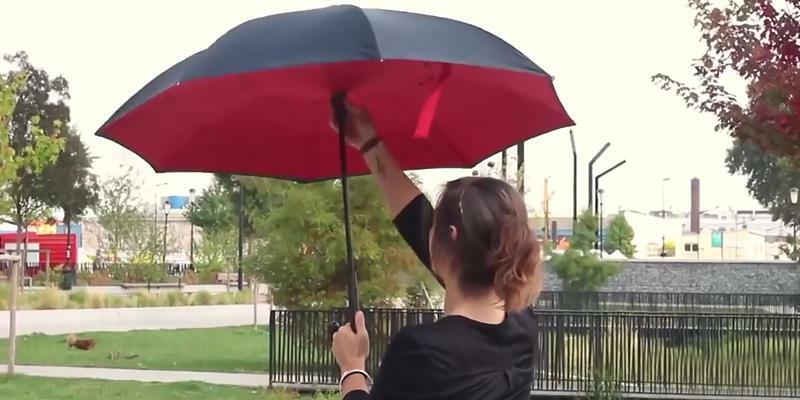 The opening and closing of this automatic umbrella can be easily accomplished even with one hand. The aerodynamic design can withstand even the strongest gusts of wind exceeding 60 MPH. Incredible and highly resilient Flex Memory frame technology allows the canopy to bounce back safely unbroken to its usual shape after being flipped inside out. The umbrella boasts 6000 guaranteed openings. Some users may find the canopy size too small. If you are looking for minimalism and compactness, then this model is definitely for you. 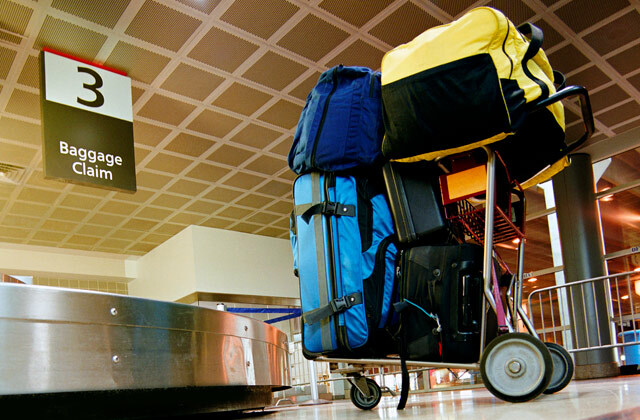 Tuck it easily in your backpack or suitcase and carry it around for the weather that can change at the drop of a hat. Despite being so small, this automatic open close umbrella will nicely protect you from the rain. Besides, you can choose from a large color palette. 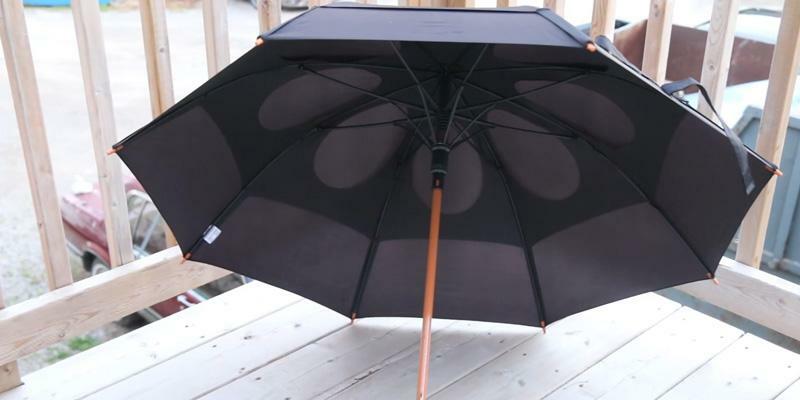 This large umbrella for rain boasts the patented, proprietary GustBuster design and construction technology. Therefore, it offers a hassle-free open and close release system; a double-reinforced, lightning-resistant fiberglass shaft that's designed not to crimp or snap. 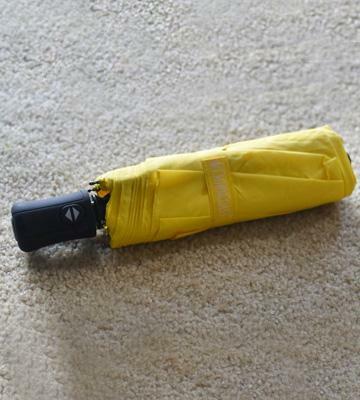 The high-impact end cap helps protect and preserve the umbrella. 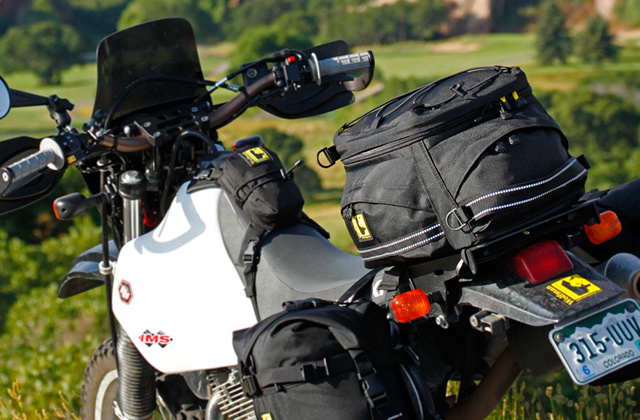 Wind-tested to withstand the winds of up to 55 miles per hour. The handle is very sensitive to scratches and marks. Umbrellas from GustBuster are the number 1 choice among all PGA Tour players. This classic rain umbrella model is perfect not only for everyday use but also for playing golf. There is a fine selection of colors and shades. Despite the length of this big rain umbrella, it can be handy enough to carry around, thanks to the included sheath with a strap. The soft EVA-handle fits well in hand and additionally has a loop that can also be used for convenient transportation or storage. The fiberglass material of the ribs ensures high reliability and durability and allows them to withstand any bending. They will certainly survive the strongest wind and the heaviest rain. 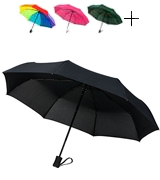 This big rain umbrella is a good choice as it is able to compete even with more expensive models. The canopy of the umbrella is supported by 16 strong ribs, which will not allow the dome to flip out on the wrong side even under strongest gusts of wind. There is a variety of color solutions to choose from. What can you do with a wet umbrella after the rain? How to carry it inside and not to make the mess with water dripping all around? Where to put the wet umbrella in a car or a public transport? How to dry all the umbrellas in the restricted office premises? All these questions must have popped into the head of almost every person on a rainy day. The problem usually comes from the fact that traditional rain umbrellas fold with a wet side outside which causes great inconveniences during their transportation and storage. It is impossible to place a wet rain umbrella on a bus seat or a car seat next to you, as everything it touches gets soaking wet. One needs to be cautious when carrying it either, as the water mercilessly drips on the floors or the feet of the bystanders. Such design has been in place since the rain umbrellas were first invented. And over all of this time, wet rain umbrellas have caused much inconvenience to their owners. 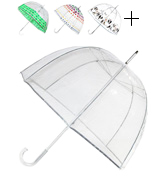 Yet, now you can leave all of these problems behind with an extraordinary Double Layer Inverted Umbrella from WASING. Its key feature lies in a simple yet brilliant solution - this rain umbrella folds inside-out and keeps all the water inside. 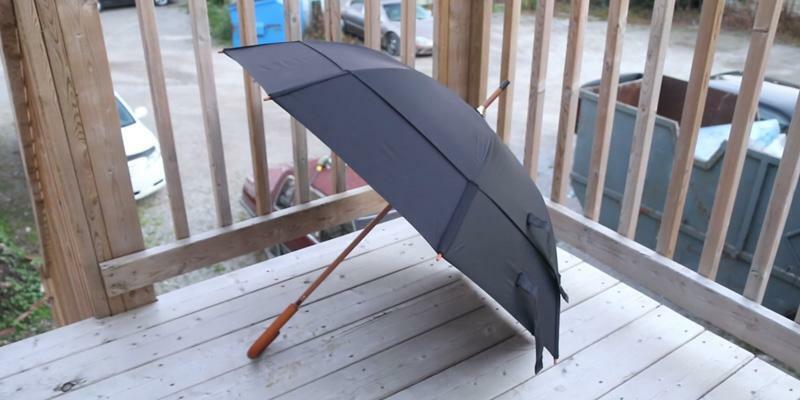 When you start using this rain umbrella, you will feel nothing short of relief as this design will provide so-long-awaited dryness to you and everyone around. With this umbrella for rain, you will forget about wet clothes, shoes, floors, car seats and puddles all around. Besides, you won’t need to open it up to drip dry the umbrella indoors. It can be placed folded in an upright position and save some scarce space in your office or foyer. The car owners know all about the inconveniences that arise from using a traditional rain umbrella. And this is related not only to its storage or transportation in the car after its use but also most importantly trying to get in and out of the car and fold or open your rain umbrella without getting wet. Do you usually fold the rain umbrella first, exposing yourself inevitably to the rain, and then get in the car? Or do you hide in the car from the rain first and only then struggle to collapse your accessory? The same dilemma applies when leaving the car. 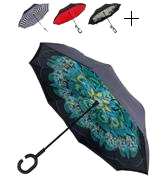 In any case, it is very unlikely that you will ever manage to stay dry with an ordinary rain umbrella. And only the Inverted Umbrella can bring you the long-awaited salvation and come to your rescue. Its creative design will ensure your dryness when you are getting in and out of the car. 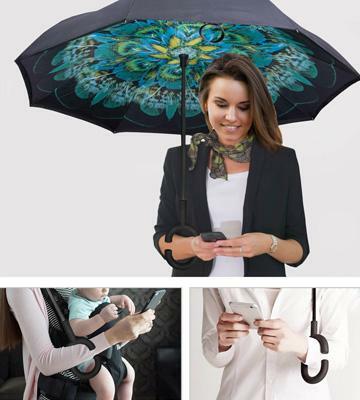 This unusual umbrella can easily be folded while sitting in the car through a slightly open door and it will help you stay dry even in the pouring rain. We would also like to draw your attention to an original C-shaped handle, which will allow you to conveniently hang the umbrella in your car, ensuring its convenient storage. On a hot sunny day, adequate protection from piercing sun rays can be provided by best sports sunglasses. Owing to their versatile and stylish design you can wear them not only when training, running or cycling under the blazing sun but also casually whenever the gray skies open and the sun pops up. What is the use of an umbrella, if it cannot perform its main function - effectively protect you from the rain! Many manufacturers tend to sacrifice functionality and durability of their rain umbrellas in the pursuit of uniqueness and aesthetic appeal. But the Signature Clear Bubble Rain Umbrella from Totes can bring to the table not only aesthetically pleasing appearance but also unmatched functionality. We can safely say that Totes Company knows how to keep you dry and safe even in the downpour, as well as how to give you the highest degree of protection against the wind and the rain. What makes their unusual rain umbrella stand out from the crowd is its original shape, which was intentionally made significantly deeper than in traditional models. Owing to such an unusual spherical and transparent design, this model vividly resembles (and therefore rightfully bears the name of) a clear bubble. The deep dome shape will provide effective protection not only from the rain but also from strong gusts of wind, reliably covering not only your head and shoulders but also the top of your back and chest. The protective properties of this bubble rain umbrella have been further enhanced thanks to the use of a slightly larger canopy diameter in comparison with other competing rain umbrellas on the market. Its diameter in the open state reaches 52 inches. Has it ever happened to you that you could barely see where you were walking when trying to shield yourself from the rain and the wind with a traditional rain umbrella? Even in the heavy rain, it would be nice to have a chance to see further than the end of your own nose and know, not wonder, where you are heading. It is a very common problem amongst ordinary umbrella users; they usually lack a normal overview when walking through the streets of the city. Two lonely passersby can bump into each other with the edges of their big rain umbrellas, being unable to see what is happening 2 feet away. 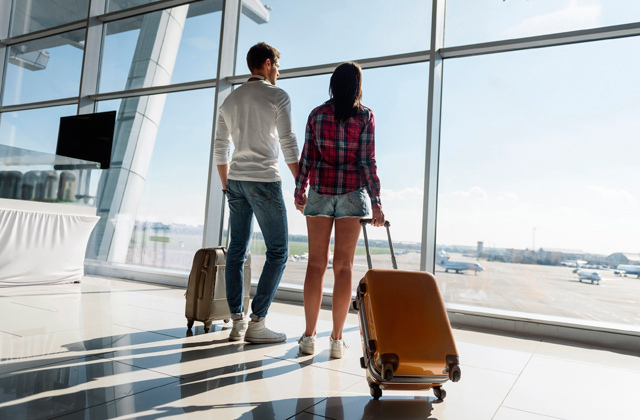 Many people know from first-hand experience about the possibility of getting injuries from such accidental mishaps caused by the poor visibility of the nearest surroundings. The transparent design of this Clear Bubble Rain Umbrella will definitely win the favor of the residents of large and populous cities. Now when walking along the crowded streets of the city or strolling on a busy sidewalk in the rain, you will be able to see clearly everything and everyone around you. Forget about accidental collisions with other pedestrians - now they are in the past. It is worth noting that the manufacturer used transparent PVC material, which is rather sturdy and durable. You can open and close this bubble rain umbrella manually without exerting much effort. The advantage of this old-fashioned but classic mechanism is higher reliability and longer lifespan, which is still backed by a lifetime warranty from the manufacturer. This bubble rain umbrella represents a full-sized non-collapsible model which even in the folded state is quite long. It features a fairly sharp tip at the end, so certain precautions must be taken when carrying this bubble rain umbrella around in the folded state. So, pay due attention to safety and make sure you do not injure anyone around, especially when using the public transport. The good news is this bubble umbrella will not require any special care. We would recommend drip-drying it in the open state and wiping it once in a while with a damp cloth. 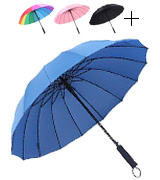 As mentioned above, when choosing a rain umbrella, compactness may be one of the most desirable factors. Compact fully-collapsible models are getting increasingly popular amongst a growing number of users. This is not surprising since not everyone may find it convenient to carry around a long, full-sized rain umbrella during the whole day. 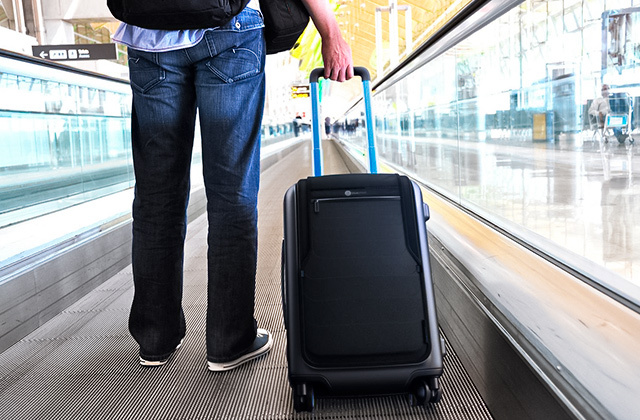 If you travel a lot by public transport, perhaps, you wouldn’t wish to drag around a heavy and bulky accessory. 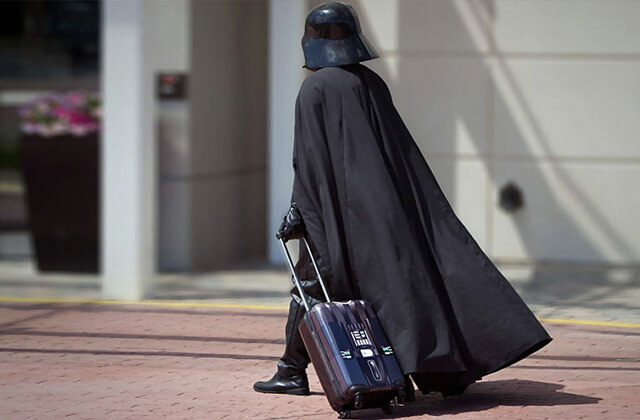 There’s always a chance to leave it absent-mindedly behind. 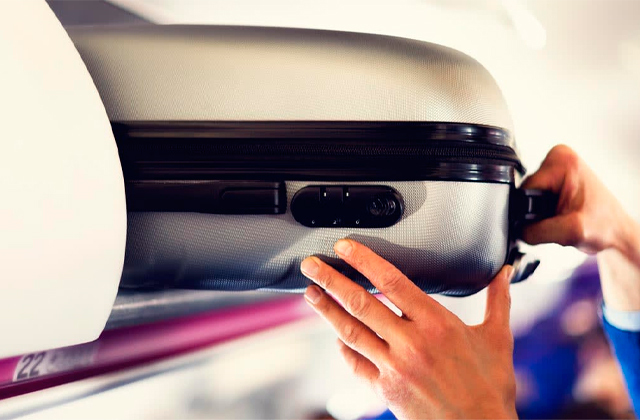 Therefore, you’d rather benefit from a compact and lightweight model, which you will always be able to keep in your purse, backpack or suitcase without even noticing it is there. So, if you are a minimalist and want to have at your disposal a compact, convenient, and at the same time very efficient and reliable rain umbrella, then this model from CrownCoast is definitely for you. 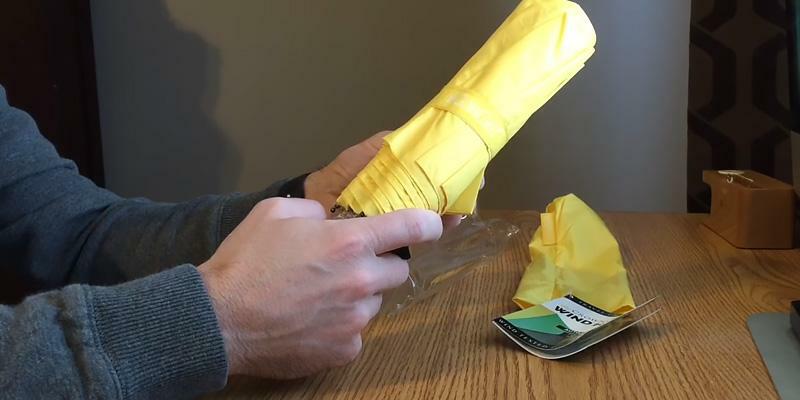 Firstly, when fully collapsed, the length of this yellow rain umbrella is only 10.9 inches, which is several times smaller than in full-sized models. Secondly, it is an automatic open close umbrella, which will allow you to easily open or close it with a simple touch of a button. If the weather in your region changes at the drop of a hat and the bright sunny day can get a little drizzly, you need to be fully armed and have a small unobtrusive yellow rain umbrella handy. This compact fully-collapsible unit with the canopy diameter of 39 inches may not be so efficient under extreme weather conditions, storms, and downpours, but it will definitely bring you the desired salvation in case of unexpected sprinkling and so unpredictable light summer rain. 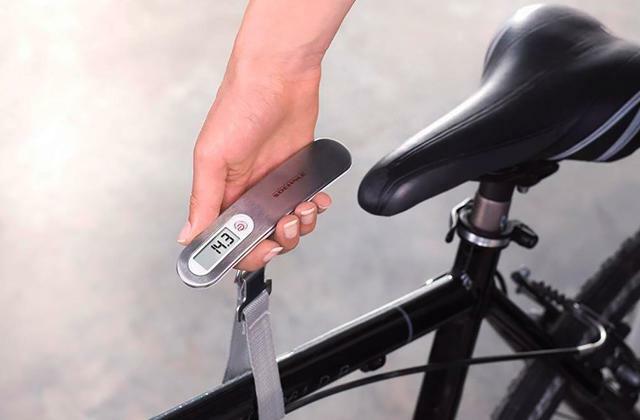 Portable and mobile, it won’t take much space in your glove compartment or bag. 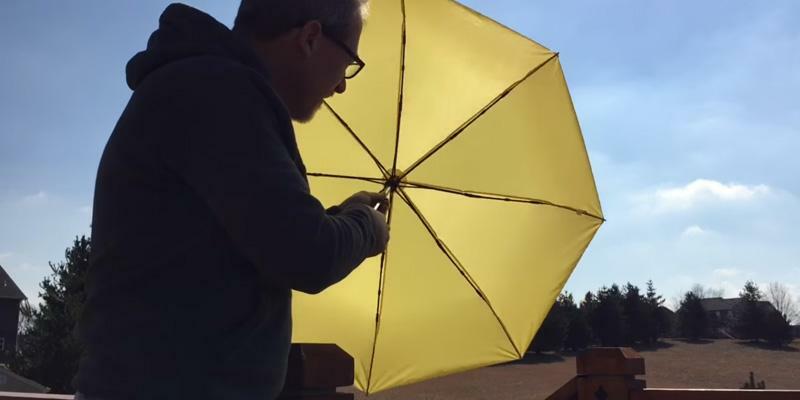 The straight handle in this yellow rain umbrella features a convenient strap for carrying it over your hand or hanging it somewhere for storage. Some of you might think that the manufacturer achieved such impressive compactness and portability at the expense of this rain umbrella’s reliability. We would like to immediately dispel your doubts and to assure you that this is not the case! 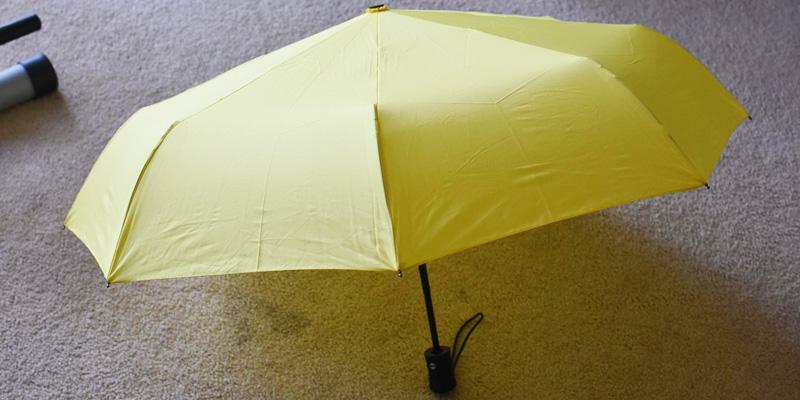 In fact, this yellow rain umbrella features a special design with excellent aerodynamic properties. According to the results of rigorous testing carried out by the manufacturer, this rain umbrella can confidently withstand the strongest gusts of wind exceeding 60 miles per hour. Besides, this model boasts certified durability, as its reliable collapsible mechanism can provide over 6000 guaranteed openings and closings. It is hard to keep your shoes dry on a rainy day. If it rains for several days in a row, you will probably run out of shoes to wear, unless you find an efficient way to dry your footwear. The best boot dryers will take care of your soaking wet shoes and will make them ready-to-wear for the next day. This handy appliance will dry them overnight and you will definitely enjoy having your shoes warm, dry and toasty in the morning. 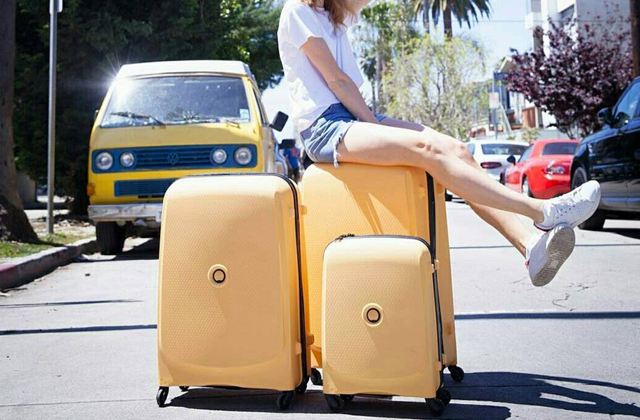 GustBuster has built its reputation on a remarkable quality, sturdiness, and durability of their products. If you live in the windy area with heavy rainfall, strong damaging winds, or occasional thunderstorms, what you are looking for, perhaps, is not a fancy decorative accessory to add a zest to your style, but a reliable shelter in a storm or downpour. Then, we believe, what you need is a large rain umbrella from such a reputable manufacturer as GustBuster, who designs its products to last a lifetime and backs it with a lifetime warranty. Although being a little pricier than a regular rain umbrella, this reliable GustBuster will prove to you that it is worth every cent you pay for it. The good news is its strength and durability do not come with additional weight. 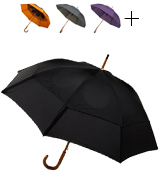 It is not only stronger than other rain umbrellas on the market but also much lighter. We can share with you some of its secrets. First of all, this classic accessory is manufactured with a patented and proprietary GustBuster’s design and exclusive construction technology. If you look carefully at these rain umbrellas, you will notice that every model features either inconspicuous or brightly highlighted rain-drops on the top of the canopy. We have to tell you, that it is not just a lovely decorative element but a thoughtful and functional design solution. These are the raindrop-shaped vents that minimize the wind resistance of the unit and hence significantly reduce the pressure on the umbrella's construction. The wind may blow fiercely, but it won’t break your rain umbrella. It will flow through the designated vent holes, while the canopy of the umbrella will effectively keep you dry and sheltered. Note that only if the wind exceeds 55 miles per hour, the umbrella does stand a chance of inverting but it will hardly ever break apart; it will revert back to its usual shape like nothing ever happened. 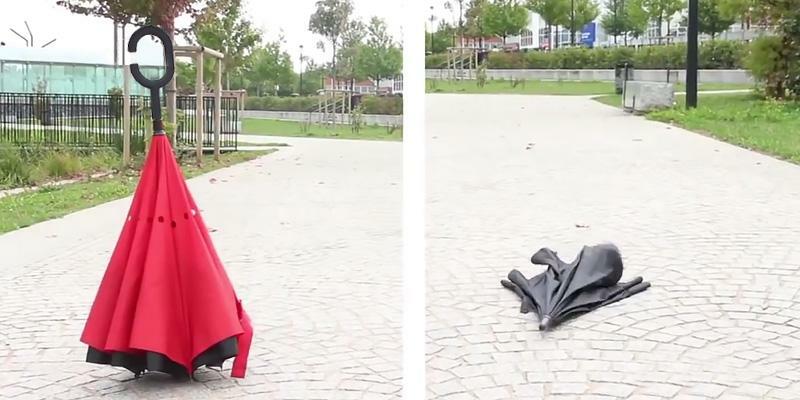 The numerous tests carried out by the College of Aeronautics in Queens, New York, confirmed that this umbrella for wind and rain can confidently withstand the wind gusts over 55 miles per hour without flipping and flapping. In a word, the manufacturer guarantees the quality of their rain umbrellas and believes that their product is able to endure the most severe storms and harshest weather conditions. 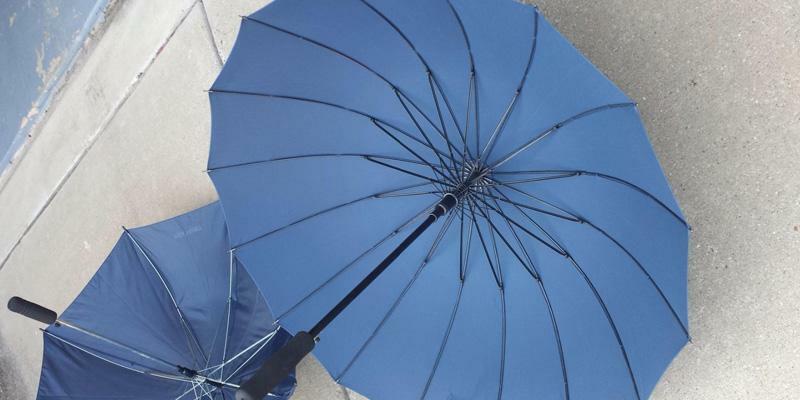 The canopy of the umbrella is made of 100 % double-layered nylon, which is not only sturdy enough to survive any nasty weather but also water-resistant to repel water and prevent your umbrella from getting wet. Therefore, you will spray much less water around and forget about messy puddles in your hallway or wet seats in your car! 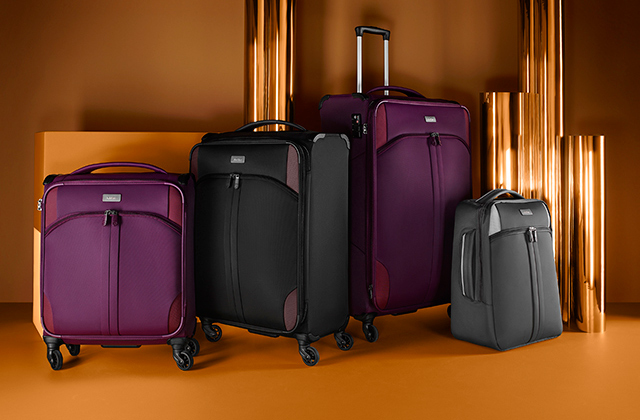 The special release system will allow you to open and close the umbrella without a pinch, regardless whether you choose a model with an automatic or manual opening. The fiberglass shaft is double-reinforced, resistant to lightning, and was securely designed in a way not to crimp or snap. At the same time, the high-impact end cap with excellent shockproof properties provides additional protection to the umbrella construction in general, and canopy in particular, even in the case of accidental drops or falls from the height. In a word, with a proven ability to survive even harsh and windy storms, this high-quality and reliable umbrella will never let you down and will serve you faithfully for many years to come. Besides, its classic appearance and a curved J-shaped hardwood handle will add an elegant touch to your style. Cold, rainy and windy weather is not the reason to give up your favorite pastime. Such tough and far-from-perfect conditions do add an extra challenge to your game but with an incredible GustBuster umbrella, chances are you will win your round. Known for their unmatched quality and reliability throughout America, these reliable protectors from the wind and the rain are the number one choice amongst many professional golf players. 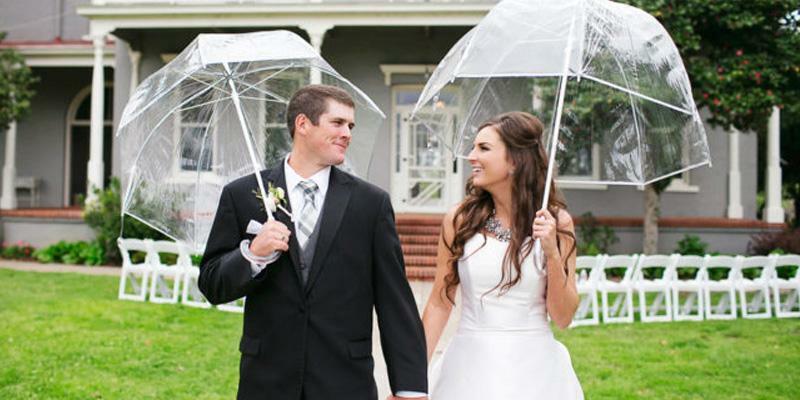 The umbrellas from GustBuster are the preferred choice among PGA Tour players. This Classic model will be perfect for playing golf, effectively sheltering you from the rain, or even from the scorching sun if needed. The large canopy diameter of 48 inches can effectively shield from any bad weather up to two people. 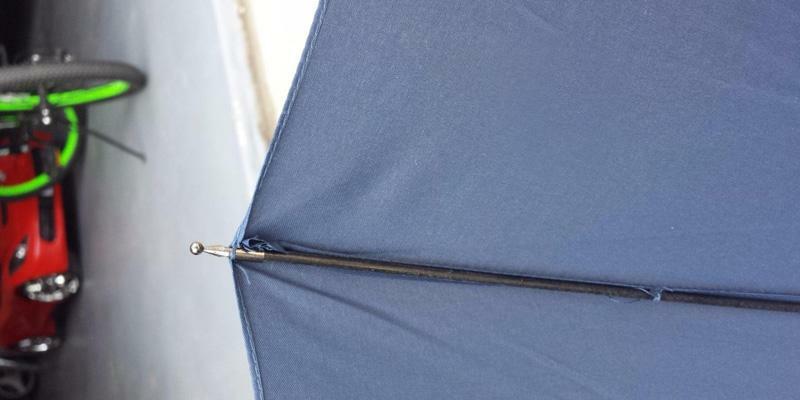 The length of the umbrella in the folded state is 36 inches. 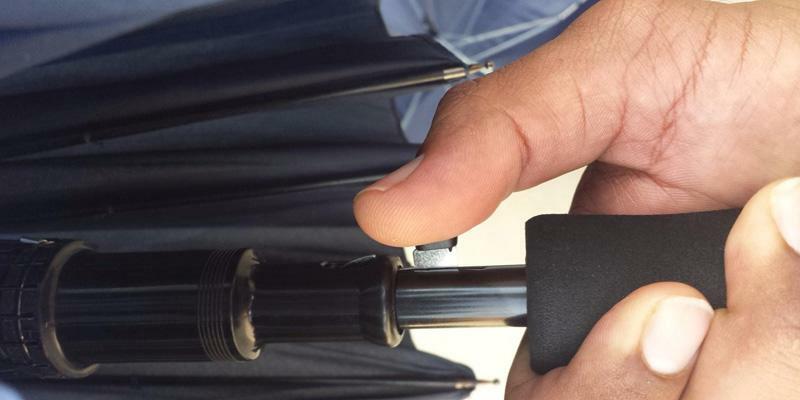 The umbrella is opened with a light touch of the button and closed manually. In fact, this is one of the most popular and reliable mechanisms that will serve you a long time. If you are an avid golf player, either an amateur or a professional, make sure to check out our reviews of best golf bags, golf shoes or golf balls, that will help you choose the necessary high-quality gear for playing golf and feel comfortable and confident on the field. As you step outside on a rainy day, you immediately notice the crystal-clear raindrops rapidly speeding, rushing and plummeting eventually down to the earth. The rain batters relentlessly the sidewalks, storefronts, windows and doorsteps of the houses. You see the water flowing vividly along the pavement and from the rooftops to form the random isolated puddles. It does take a lot of dexterity to navigate the streets when every step you make can get your shoe disappear in the muddy water. Yet, you feel that this rain was needed, as all the nature and the earth feels cleansed and purified. The rain has washed away all the dirt, dust, and filth that had been accumulating on the dusty and polluted streets of the city. You take a breath of fresh air savoring the calm and peaceful serenity that comes only with the rain. As the wind intensifies, people tend to disappear from the streets. Those few lonely souls that remain tend to walk quickly with bent heads and hunched shoulders, holding the buckling umbrellas before them as life-saving shields. The wind that comes with the rain is uncontrollably mischievous. It plays games with their umbrellas, teasing naughtily in under the feeble canopies and then whipping them forcefully inside out, leaving the poor men exposed and unprotected before the mighty force of nature. With an amazing and reliable umbrella from Saiveina, you will be able not only to enjoy a carefree stroll in the park in the light summer rain but also find a reliable shelter in the nasty weather. As the storm intensity rises, not every umbrella is able to resist the crushing effects of the overpowering gusts of wind, that may act for fleeting instants with tremendous force. The Straight Umbrella from Saiveina will serve you faithfully in any weather. The distinguishing feature of its design is an extra-large number of ribs in comparison with ordinary models. This large rain umbrella from Saiveina can boast all 16 pieces, which makes this number twice as large as in the traditional models. The multitudinous ribs keep the canopy of the umbrella stretched as effectively as possible without loosening and sagging even in the wind. Such design really ensures its stability in high wind and has a positive effect on the resistance of the umbrella to buckling under the strong wind gusts. The manufacturer guarantees that there will be no twisting or flipping inside out no matter the strength or force of the storm. It is worth saying that all the ribs are made of fiberglass material, which can withstand even the strongest bending; while the central pole is made of aluminum alloy. The canopy features 210-T waterproof fabric that effectively repels water and does not fade in color even after a long use. This umbrella can be considered as an all-around great buy, as it is perfect from any perspective: comfort, convenience, durability and efficiency. In addition to unfailing protection against bad weather, you will also get easy operation, transportation, and storage. Firstly, thanks to a straight soft-to-the-touch EVA-handle, this umbrella will very comfortably sit in your hand. Secondly, for convenient transportation and storage, the umbrella can be put in a special sheath with a long strap. 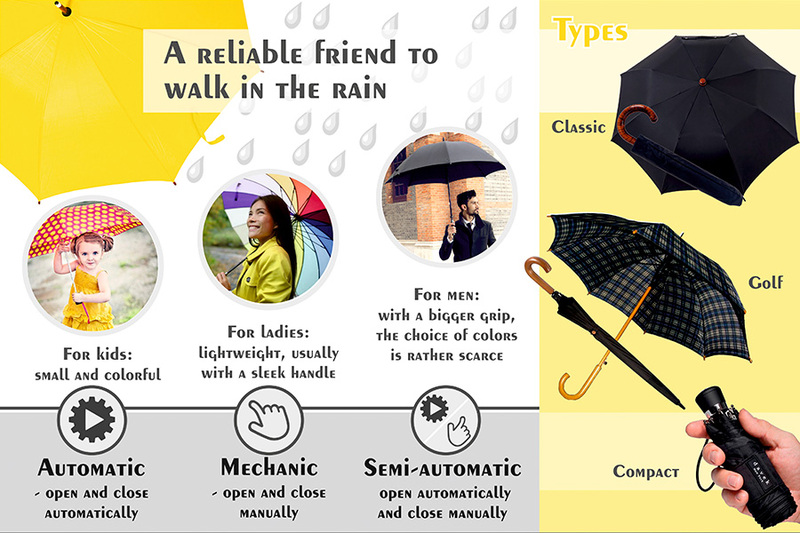 This rain umbrella will be perfect for both men and women. The model is available in a variety of different colors so that you will easily choose the one that fits you best and highlights your personality! We believe, that all these facts confirm that this umbrella is strong and durable enough, being capable of long unfaltering service. Besides, thanks to its well-thought construction and design, it is simply cheery to traipse around with. If you are a business person, then you probably care about your image and the impression you make on your business partners. 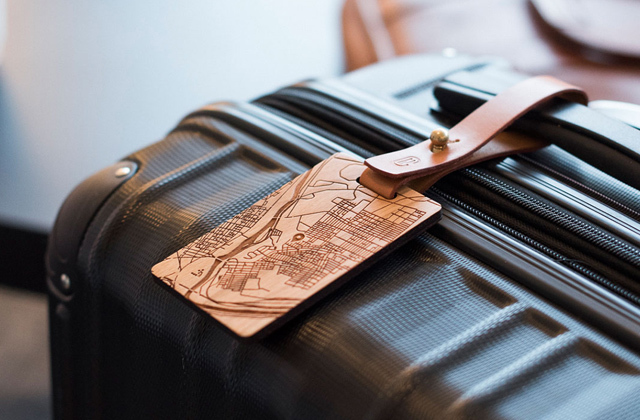 The best addition to any stylish umbrella will be no less stylish briefcase, in which you can easily carry your laptop, accessories, or important documents. With one of the most stylish and reliable briefcases, you will march with peace and confidence to the most important business meeting in any weather, as you will be positive that your belongings are safe and thoroughly protected. Unless you are in the mood to dance and sing in the pouring rain, you would certainly appreciate an opportunity to hide under a welcoming canopy. The rain umbrella is a truly universal accessory, which can provide a shelter from the heavy rain, shield you from the chilling wind, as well as protect you from direct sunlight. 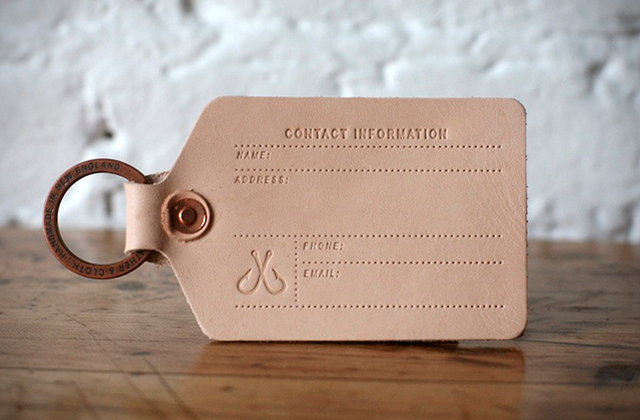 Nowadays, there are a lot of different options to choose from in size and type, style and design. In this review, you will find a piece of advice on how to choose the right rain umbrella to fulfill your whims and needs, as well as the description of the best models currently available on the market. If you can't imagine a weekend or a summer day without a quality time with your family and friends outdoors in the open air, for instance, near the house or a pool, then we recommend you to have a look at our review of patio umbrellas. No matter if it drizzles or sizzles, you will always be able to safely savor the delicious coolness of the fresh air in the protecting shade of a nice patio umbrella. Also for those who want to protect their car from bad weather conditions, we recommend purchasing one of the special carports presented in our review. We can name the following materials in the descending order of their durability: brass, nickel, and black painted. Fiberglass will probably be the most preferred choice amongst many umbrella manufacturers for many years to come, as it is highly flexible, reliable, and ultralight. Only tempered spring steel can compete with the fiberglass when it comes to stability; it offers better stability at the expense of heavier weight. The lightest of all are the frames made of aluminum, but they will easily bend in the strong wind. 8. 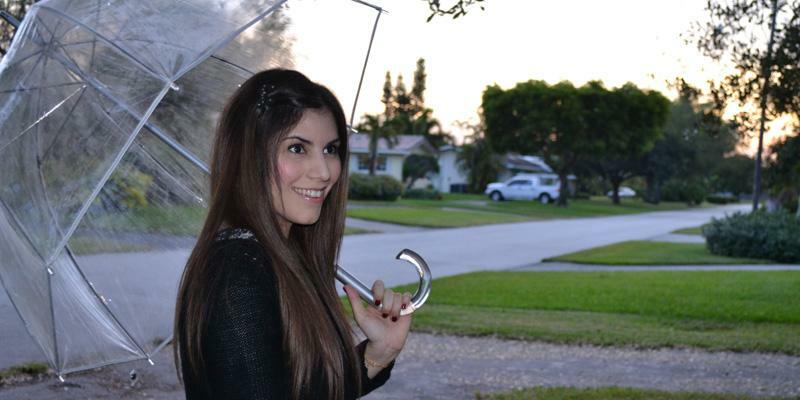 Armine Karapetyan Umbrellas as Fashion Accessories: How to Choose an Umbrella, Fashionisers. November 28, 2015.